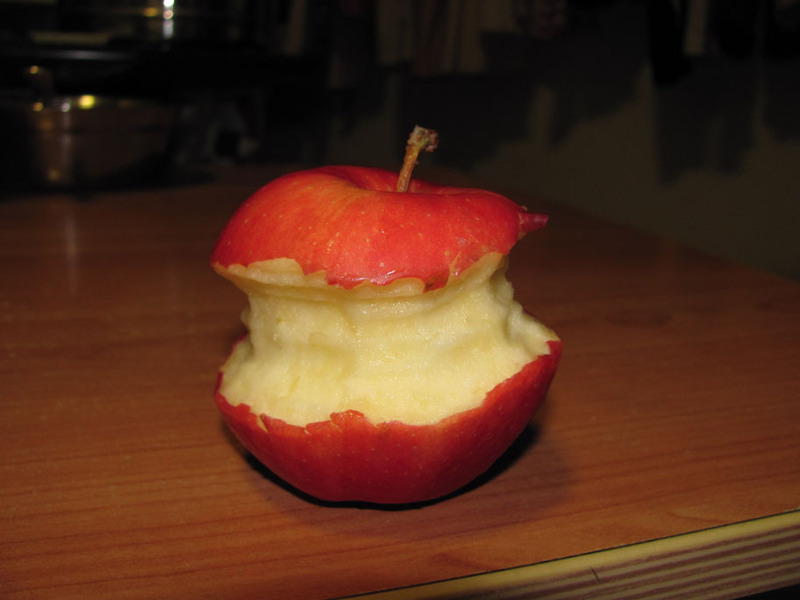 Apple Hamburger – I Can Do It! 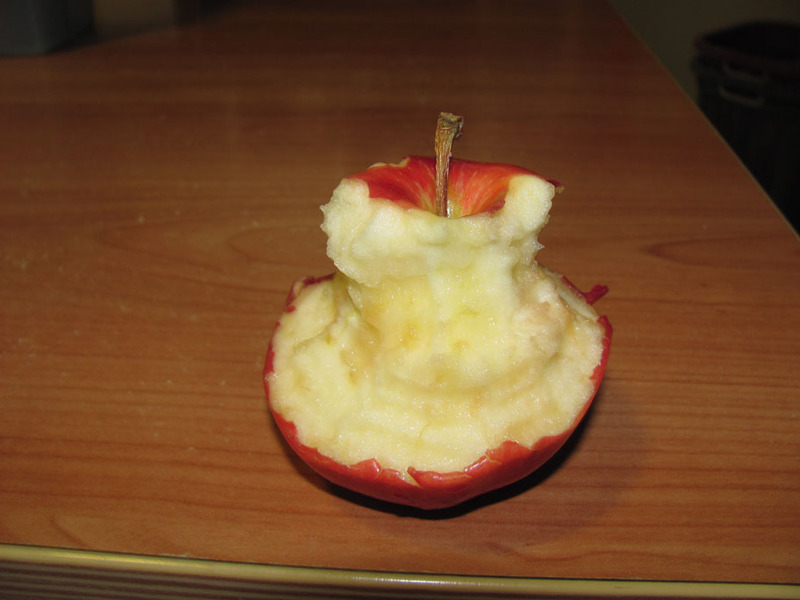 Have you heard of an ‘apple hamburger’ before? No? Neither have I. But sweet Li-Ann came up with this. 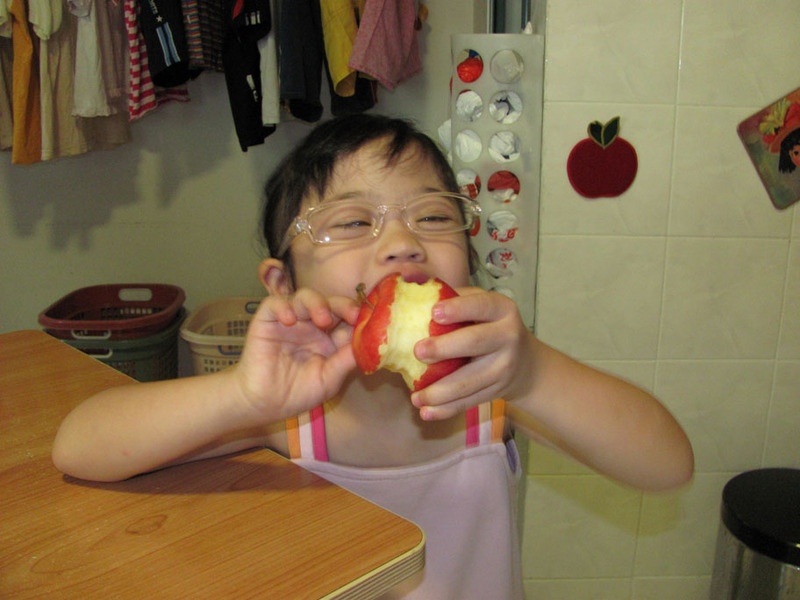 Li-Ann wanted an apple after dinner so I let her eat one, although I knew she won’t be able to finish. Usually, I would insist she share with either one of us. But not tonight. For the FIRST time, she kind of gnawed (I know I made her sound like a rabbit) around on a WHOLE apple ALL BY HERSELF and then told us, about 5 minutes later, “This is apple hamburger.” I’m not sure about hubby but I was EXTREMELY surprised. And it did look like a hamburger of sorts. I quickly grab my camera to take some photos. Then she proceeded to marvel at the teeth marks that she made in the apple and said, “See my molars.” I’m not sure where she got that idea from. We did have discussions about teeth as one of her permanent bottom front tooth is peeping out quite a bit. Or perhaps she has heard Rebecca groused about the pain she has been feeling in her gums due to her molars erupting. In another 5 minutes, she told me, “Mama, I don’t want to eat anymore.” By then she had already eaten off the top of her ‘hamburger’. That was FAST!! Finishing three quarters of the apple! 1. 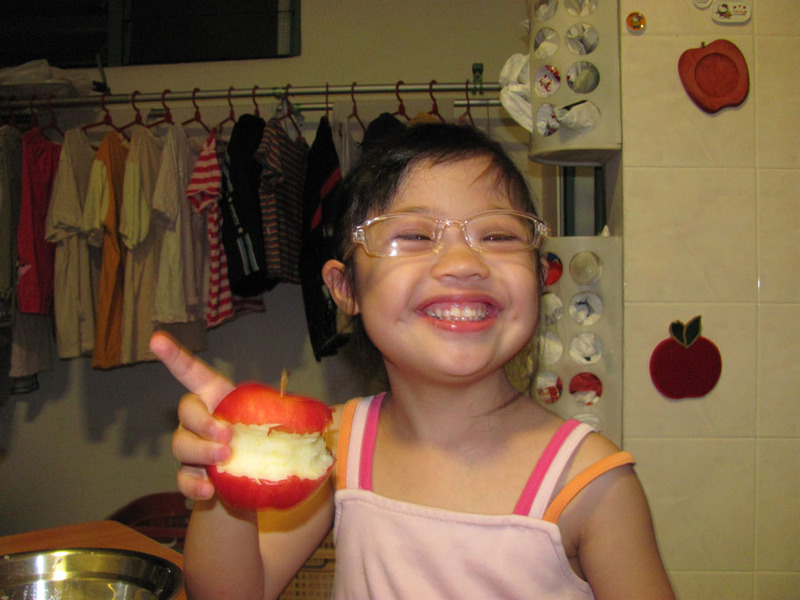 Her oral motor skill has improved and she is able to eat the apple independently with the skin (the apple is NOT the soft type) and she’s able to finish 3/4 of the apple within a short time of about 10 minutes. That also means that she has to chew and swallow the pieces in her mouth fast enough too. 2. Her fine motor skill has improved as she is able to hold the apple for at least 10 minutes without saying that it’s heavy and also being able to turn the apple in a consistent way to get her hamburger pattern. 3. Her imagination and creativity shows the healthy development of her cognitive ability. She continues to surprise us with her childlike insights to the world around her. Previous postTo Go or Not to Go? What a funny story and indeed impressive. What imagination!! Ahahaa.. I first thought that you came up with a new healthy invention for a snack. This proved otherwise. Children never fail to bring laughter to us. Hahaha…Maybe I should invent some healthy snacks right? I thought it was interesting too. That’s why I HAVE to take the photos and share about it. She was so cute!! !